This week I have two events to report, although there are plenty of other things going on as well at the Centre. However, as a continuation thematically from last week, I want to highlight the Centre’s work in bringing students face to face with documents from medieval times that they can explore as ‘true’ historians. From the comments I overheard on Monday, there is something immensely satisfying, as well as exciting, when you look at a book or single sheet of paper that perhaps few have looked at since it was produced 500 years ago. The first documents I want to draw your attention to are two wills made by Canterbury people either side of the Henrician Reformation. The beauty of these two is that they were made by real people, and even though there are all sorts of caveats when analysing wills, they still take us closer to Dorothy Laurence (1523) and Thomas Kele (1548) than anything else in the archives. Although I could write this whole blog of these wills, I’ll confine myself to one point for each and with the passing remark that clothing was very important to both Dorothy and Thomas – among her clothing she mentions her ‘tawney gowne lined with Sateyn of Sypers with velvet coffes’ and he had a gown ‘of the new colour faced with bonge welted with tawney veluet’. But it is her charitable bequest of 3 sheets and 2 pillows for the use of women in childbirth in the parish of St Andrew’s that caught my eye. This bedding was to be in the charge of the St Andrew’s churchwardens who were to lend it out as necessary until it had worn out. There is nothing in her will that specifically mentions her children, which suggests that she was a childless widow at her death, this charitable gift and her other bequests to named maidservants, presumably young women, in some ways meant they had become surrogates for her own family. As a result the beneficiaries remembered her in their prayers – those in childbirth bringing in the next generation and the maids perhaps looking forward to marriage and their own children. Even though such ideas could in some ways have crossed the Reformation divide, the link between donor and recipient through the return gift of prayers for the soul had gone. Rather such charitable acts, for those whom we might term Protestants, were to be seen as the mark of a God-fearing Christian, an example that s/he should continue to follow, just as such acts provided examples for friends, kin and neighbours. Thomas Kele was one of these and the preamble to his will offers a fantastic picture of how he, through faith, envisaged his relationship with Christ. I’ll just pick out a couple of phrases: ‘faithfully with my harte turnynge vnto Christe the bisshoppe and curat of my soule’ and ‘so I am christes and he ys myne to lyve in hym, to dye in hym, to continue with hym for euermore to whom I commende my soule as a spouse decked with all giftes of grace thorough hym’.This apparently unshakeable confidence is interesting, and at the beginning of young Edward VI’s reign for men such as Thomas the presence on the throne of a young king with his life ahead of him who would stamp out the old region and its ‘popish superstition’ was extremely welcome after the worries of the final years of his father. Consequently, even though Thomas was sick when he made his will, he may have felt his two sons would inherit this brave new world in religious terms. Thomas had been a stationer, and even though there is no known link with the printer in St Paul’s parish, they were seemingly of a similar religious persuasion. Among the other documents the sixth formers looked at were two rolls of Canterbury quarter sessions from 1536 and 1540 (Canterbury, as a county in its own right, held these more senior courts). The 1536 cases include a prosecution against this printer because he was said to have printed and sold a range of books to ‘divers rude and unlearned people’, the books seen by those in authority as ‘against the faith of true Christian men’. Such a use of the lay courts regarding what might be seen as heretical issues was not new; but does demonstrate again the blurring between Church and state (king sometimes with Parliament), especially at a time when this relationship and what it meant was changing and under close scrutiny. For among the printer’s supporters was John Twyne, who at the same court session found himself before the civic judicial bench for speaking against the worship of saints and ‘against all laudable usage and custom decreed by holy church’. Under the 1540 quarter sessions, the students saw a case that similarly involved books and reading which the civic authorities (and Henry’s government) viewed as problematic. In this case those reading illegal books were servants: John Cokker, Thomas Mylles’ servant, Haselwode with other unknown servants who had gone to Richard Farrere the shoemaker’s house in Jury Lane. What they were reading is not stated in the record, but it is worth bearing in mind that parishes had only recently been instructed to purchase a Great Bible in English that theoretically could be read by any parishioner, who could read, in his/her parish church. Such a Great Bible was also on show to the sixth formers, the frontispiece offering insights through the imagery of how Henry VIII, as the conduit from God to Henry’s people, sat on his great throne handing down the Bible – God’s word, to both Cranmer and the bishops, and Cromwell and the aristocrats, who in turn passed it down the social hierarchy. For the only person who missed out from being part of this holistic God-given kingdom was the monk in the prison cell down in the bottom corner. Keeping with the theme of forbidden or at the least discredited knowledge, the sixth formers also looked at an English early printed book, The Golden Legend printed by Caxton’s successor Wynkyn de Worde. 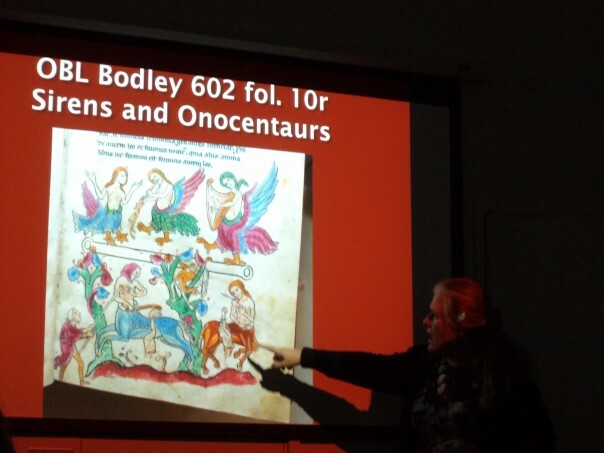 As the students discussed, its printing in the late 15th century indicates its popularity because otherwise de Worde would not have sunk time and money into printing this particular book. These narratives about saints offered a wide range of information, but the students noticed that even though St Thomas of Canterbury was listed at the beginning, when they came to look for the entry about him it had been cut out. It was agreed that such an action probably took place soon after the destruction of St Thomas’ shrine in 1538, an indication of just how much Henry wanted to obliterate any reference to someone who had for centuries been seen as the champion of Roman Christianity. For the purposes of the workshop, The Golden Legend was paired with the St Andrew’s parish churchwardens’ accounts that begin in the late 15th century. Although it is a great pity the church no longer exists, these accounts can be used to give an idea of what it was like, the large number of altars and images, the clock and the pews (constructed in the first decade of the 16th century), but equally the effect of sweeping away all of those aspects seen as popish, to be replaced by monies spent on whitewash. The students agreed that the amount spent of candles would provide a valuable indicator of the state of the Reformation, although it was accepted that candles just to light the church would have been a continuing drain on parish funds. However, St Andrew’s, unlike St Dunstan’s, seems to have been less excited about the prospects of joining the Reformation, which is perhaps not surprising given its early sixteenth-century rood loft, another casualty of changing beliefs. The students did not solely explore religious changes, because they also looked at an inventory of the Cheker in; Henry VII’s charter to the city regarding its boundaries in relation to the cathedral precincts; the cappers’ guild rules, which drew on ideas from the cappers of London and include certain protectionist policies, and a civic book that includes the city’s custumal (bye-laws and other similar information) that was copied up by the common clerk in 1512 – in some ways a challenging time for Canterbury because pilgrimage to St Thomas’ shrine seems to have been on the decline and the city’s cloth industry had taken a hammering from the growing importance of Wealden cloth production. 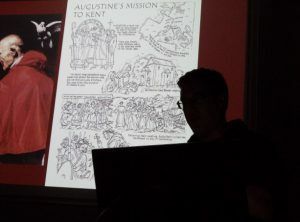 However, at this point I want to give a brief summary of the Canterbury Historical and Archaeological Society’s [CHAS] lecture this week in which Dr Andrew Richardson of CAT gave a fascinating assessment of late Roman to early Anglo-Saxon Kent up to the arrival of St Augustine. Andrew was very keen to point out that thinking about whether we are looking at continuity or change is not a helpful way of considering this period, rather we need to look along the spectrum between these polar points. 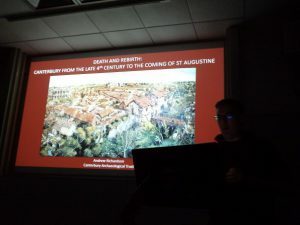 For Canterbury is not a Silchester, it was not a thriving Roman town that thereafter was abandoned totally to become a grassy field, rather Canterbury seemingly lost its urban mentality in the 4th century, before the beginnings of recovery in the 5th century. Yes, some people were still living within its Roman walls but seemingly not because it was a civic entity, rather it offered space, a river, building materials and land for farming. 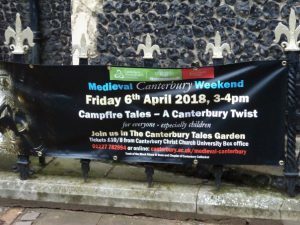 Sure, the Roman town wall survived, but that does not make a town, and no-one was going to take it down just to prove Canterbury no longer existed as an urban centre. 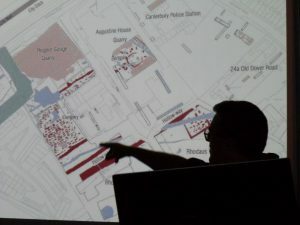 In his talk, Andrew drew heavily on the Trust’s excavations over the last 40 years, but also before the Trust was formed, especially those at the Marlowe Arcade, St George’s Street, Haslett’s Garage, the area close to St Peter, Whitefriars, and the area of Augustine House and associated buildings. 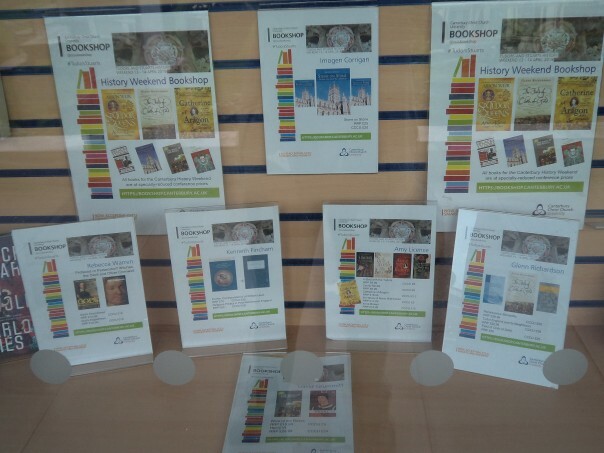 Some of this has only been written up in the grey literature, but gradually sites are being written up for full publication, and among these are the multi-volume productions such as Whitefriars. 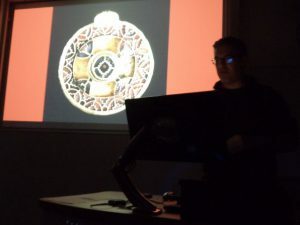 In tracking these changes, Andrew pointed out what burials – where (inside and outside the city), degree of care, in what form, presence/absence of grave goods, orientation of bodies – could offer. Also significant is the degree the Roman street pattern was abandoned because in some places people built across streets, that is over what had become the dark earth layer – a mark of abandonment to the worms, the streets gradual filling up with detritus. Also seemingly lost at this time, or at least its use severely restricted was the great Roman Ridingate, one of its two doors shut and nailed up, the space becoming a workshop. It what might be seen as the second part of his talk, Andrew explored just where these invaders/settlers appear to have come from. 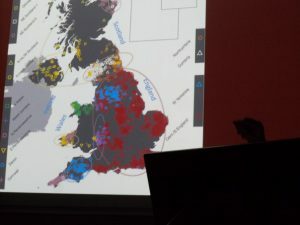 Like his analysis of the earlier period, he was keen to explain this should not be envisaged as an either/or situation, rather it was far more complex and what we seem to have evidence for is the movement of peoples around the North Sea coastal zone, reflected in common forms of material culture. Furthermore, Canterbury was not one of the early power centres, these were places such as Eastry and Lyminge, and it was not until the late 6th century that Canterbury appears to have started to become a special place, greatly aided by the arrival of Augustine and his brethren. Again, alliances across the sea may be important in this period of history, the kings of Kent apparently aligned their kingdom with the Franks, through marriage, trade, and then religion. Thus, Andrew gave his audience much to think about and several people came up afterwards to ask about the topics and to seek additional ideas and information. Moreover, if anyone is interested in this period of Kent’s history, I would recommend Andrew’s chapter in Early Medieval Kent, similarly works by Stuart Brookes, and a very readable account by David Birmingham on Canterbury up to the Norman Conquest. Next week I’ll be back to Faversham and I believe there is also the Lambarde Lecture on Wednesday 21 March at 6pm in Old Sessions when Professor Helena Hamerow (University of Oxford) will be speaking on ‘Rural Settlements and Society in Anglo-Saxon England’, all are most welcome.